Penguin Diner 4 is a fantasy cooking game where you get a chance to serve hungry customers coming to a diner. This is a point and click game where the objective is to earn as much money as possible in a day when the diner remains open. You need to be quick and efficient to serve a large number of customers in a short time. You can get more money in the register if the service was quick. The upgrade catalog is quite extensive and various categories of accessories for the diner can be purchased from this area. 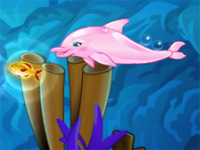 This is an online flash based point and click game. Mouse is the important part of this game. The keyboard does not offer any use for this game. There are no shortcut keys offered to play the game. This is a point and click game and all actions can be undertaken by clicks. If you want the waiter to move to a particular table to take the order, all you have to do is point the cursor at the specific table and click. The objective of the game is to successfully run a diner for a number of days in different parts of the Antarctic. You can win this game only when all levels of the game are cleared. The difficulty of the levels increases gradually. You can go on to the next day when the target set for the current day is achieved. The money that was collected during the game can be used in the catalog section to buy additional stuff for your diner. There are different areas in the city where you have to run the diner. When one area is completed successfully through days one to ten, you will be able to move on to the next area. It is possible to save your game at any point and resume it at a later day from the same point. You can pause the game for short breaks and click on End day to save the game for later play. If you want to win the game, you need to work fast. Seating customers, taking orders and delivering orders all need to be done quickly if you want to get more money. Comfortable customers will spend more money. A couple seated on a table with flower decorations will spend more money than a single person seated on a plain table. Remember that penny can carry two trays of food at a time. Hence you can take orders in a way that they can be delivered minimizing the trips Penny has to take. There are quite a few types of upgrades possible. You can choose the things to buy according to the money in your bank. As the levels go up, you will be making more money and the cost of things will also go up. Buying things however will also help you in providing a better service in your diner. You can even buy additional tables and chairs so as to accommodate more number of people in the diner. Decorations with table cloth, flower, comfortable seats, entertainment through music or television, live entertainment and skates to move fast can be bought from this section. It is also possible to add chefs to your diner to expand your menu and to help increase the speed of service.